There are few things in life I hate as much as waiting. I remember my grandmother reciting the lines to one of her favorite poems when I was little, as I jumped from one foot to the other, hurrying her along in my mind. My grandmother is a fairly patient woman. More importantly, she understands the power of patience. She is one half of the frugal dynamo comprising my maternal grandparents. A little background, if you will. My mom’s parents were born at the end of the 1920s and beginning of the 1930s and were Depression Babies. My grandfather Leon, especially, grew up in the middle of the tobacco fields and sharecroppers of central North Carolina. When he was a little boy, about Little ThreeYear’s age, his dad left, leaving my grandmother alone with two small children. My grandfather had to work in those same sharecropping fields, picking cotton and beans to make money so his mama and sister could eat. They’d trap rabbits for the occasional meat to add to their meals. They were so poor that food was a constant concern. My grandfather enlisted in the army, got to enjoy spending a few years in the late 1940s in Italy as part of the post-WWII US military presence in Europe, and then came back to the US and met my grandmother. He got a job at South Carolina Electric and Gas as a lineman and started his family. They began saving immediately and a goal was planted in my grandfather’s mind. He wanted to save up $1 million in SCE&G stock. He was playing the long game. It took just about fifty years for him to accumulate his $1 million in stock, but don’t you know he did it? More often than not, though, if you can teach that little voice to wait just a little bit, and be even a little patient, your wallet will be rewarded. There are so many benefits to waiting for things. A few months ago, I saw a pair of beautiful shoes online. I looked up the price. They were $79. I don’t pay $79 for shoes. If you do, I am not judging you. I just don’t happen to particularly value clothes and shoes and I usually buy mine at the consignment shop. But these shoes were beautiful. Handmade in Spain, soft buttery leather, and apparently extremely comfortable for walking around during long trips. I really wanted to buy them right then. Instead, I made myself wait three months. I budgeted one third of the cost in my spending money account each month, and finally, when I had $79 (shipping was included), I ordered them. I didn’t get them on sale. The price didn’t go down. Summer slowly wound down as I waited to buy these perfect summer shoes. So what was the benefit of waiting in this case? By making myself wait for three months, I made absolutely sure that I really wanted the shoes. I had three months to think long and hard about whether they were a good way to spend $79, and if I’d have regrets afterward. At the end of the three months, I wanted them just as much as I did at the beginning, and since they’ve arrived, I have absolutely loved them. I wear them all the time, and even walked all through Disney in them. They were, as promised, super comfortable, even when walking six miles a day through a theme park. This is me in my stylized pose with my Pons shoes on. Yes, I spent about five whole minutes posing with my beautiful shoes. I have *several* shots like this. That is Lesson 1 of Waiting. By waiting a day or a month or even a year for a material good that you’d like to purchase, you make yourself think about whether you really want it, need it, and will use it. You stop the consumption cycle of “Buy Now” where you click and ship without thinking about the long-term implications of your purchase. When we first moved to North Carolina and into our neighborhood, we really wanted to join the tennis club. There are hard courts, clay courts, and indoor courts at our tennis center. We live within walking distance of the courts, and we thought that joining the tennis club would provide us both fitness and socialization, two key elements we feel are really important to cultivate in our new home. The monthly fee for using the tennis courts was comparable to what we’d occasionally paid back in New Hampshire, and it was right in our neighborhood, not 25 minutes away, like it was there. The only problem was, the initial fee to join was astronomical. We knew there was no way we were paying that much money to join the tennis club. When we were in the process of buying our house, we talked to the Membership Director and she hinted that there might be a possibility they’d drop the price in the fall, but she couldn’t guarantee anything. We moved into our neighborhood on July 2nd. People kept asking us if we were members of the tennis club, and we said, sadly, “we are not. But maybe soon!” Neighbors urged us to join, so we could join in the fun. We waited all through the summer for any news of a drop in the application fee. When Mr. ThreeYear got invited to a tennis mixer in early September and had a blast, I went and had a chat with the Membership Director again. “I’m sorry,” she said. “I’ve talked to the Board of Directors and they said there’s no way they’re going to do any specials right now. They believe the membership fee is fair.” Mr. ThreeYear and I talked about it and were torn. Maybe we should just pay it? In mid-September, after our talk, the Membership Director sent us an email with a special: we could have six months of reduced fees if we joined by the end of September. Mr. ThreeYear asked about the membership fee. Still the same. We didn’t join the club. I felt a little bit like we were letting a good opportunity pass us by. But then, while on our Disney trip, we got an email from the Membership Director, and, surprise: they were running an October special where they dropped the membership fee by more than half AND gave us reduced dues for six months. I had just about talked Mr. ThreeYear into joining with the September special. Thank goodness we waited. We ended up joining the club at a much lower price and getting an unexpected deal on our monthly fees. I’ve learned Lesson 2 of Waiting again and again, but I still have a hard time with it. Often, with sales, the idea is to make you think this is the best possible deal ever, and you have to buy right now! I am particularly susceptible to this, maybe because I have a hard time with FOMO. “If I don’t buy this now,” I think, “I will never be able to buy it again. It will go away and I won’t be able to have it.” The rational side of my brain has to argue again and again with this insistent youngster who is just sure she is missing all the fun. 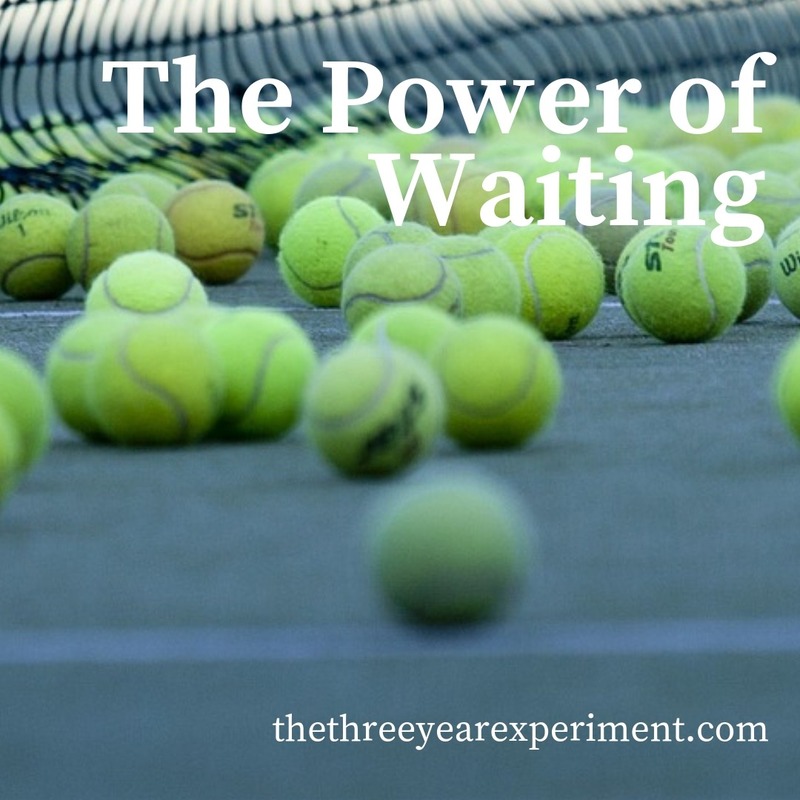 For our family, Lesson 3 of waiting is the most frequent. Most of the time, if we hold off on buying something, we realize we really don’t need it that much. While we were at Disney last week, we told the boys they could pick out one souvenir each. At first, when they grabbed swords, figurines, and light up wands in the gift shops, there were a lot of things they wanted. But because they could only pick one thing, both of them realized there was nothing in the gift shops they really wanted. Junior ThreeYear negotiated with us and we ended up agreeing he could spend the souvenir money on an unrelated game he wanted. Little ThreeYear decided that he didn’t really want the Viking gear–a picture was enough. There are various tricks people use to make themselves wait–spending bans, mandatory waiting periods for big purchases, exhaustive internet searches. 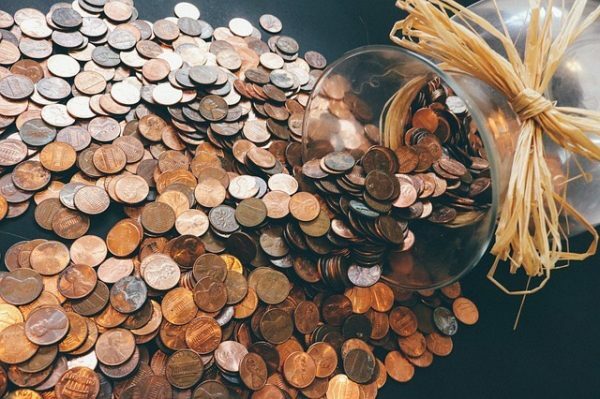 We use a budget, which is a somewhat artificial way to keep our spending at certain levels. If we see a really great deal on new box springs we’ve been waiting to buy for years, but enough money isn’t our home improvement budget category, then we have to stop and really discuss the purchase before pulling money from our savings. The budget has been a great way for me to get better at waiting, because of that particularly petulant voice inside that shouts, “I want that now!” It’s taken such artificial measures to keep myself in check. The tricks retailers and salespeople use on us to get us to buy now are used because if we waited, even just a little bit, we’d realize we don’t need the tent that sleeps six that is 80% off, or the automatic kettle that looks beautiful and heats water in 12 seconds but costs $247. I’m sure it’s a lesson I’ll have to relearn time and again over the years, but for now, I’ll be happy in the knowledge that we didn’t overpay to join the tennis club. What’s your best story of the financial benefits of waiting? Well, not really a story but more of strategy. Golfing is my sport and the best strategy as far as buying golf clubs is to wait ’til the new model is out, usually the following year. They usually drop the price by at least 35% on the older model. It does take a lot of patience and self-discipline not to pull that trigger out as it’s very tempting. I just did the same thing! 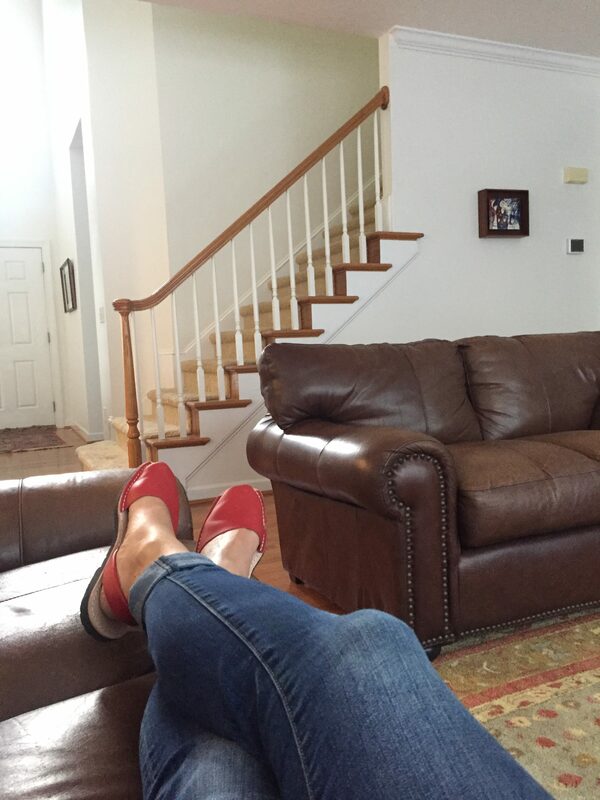 I have a model of shoe that I like, so I bought last year’s style on clearance from an online outlet store. The $100+ shoes only cost me about $50 with tax. Nice! I always wonder why anybody would spend the full amount when you can get great shoes for about $50 (that’s kind of my personal threshold too!). Ah you did take your family to Disney! How fun! I didn’t go at all even though I was curious about Epoct’s food festival. I guess I’m waiting on that until I have kids to enjoy it with 🙂 and when the weather isn’t so hot. Expensive, expensive, expensive. Fun, but, there are other fun things to do that don’t cost as much money. We’ve done it, the box is checked. That’s how I feel honestly!! Way to go!!! We did the one souvenir thing with the girls at Disney this Summer as well. Ava, right away, picked out a Cinderella jewelry box with the music and twirling princess when you open it up. Bella picked out a small jasmine figure set, and Nora picked Merida’s bow and arrows. Two of the 4 bows broke in the car on the trip home and Nora never played with it again. Bella’s get played with once in a while, and Ava wanted to understand how the music and twirling worded – so she broke the box to figure it out, haha. Next trip – the only souvenirs will be our photos! 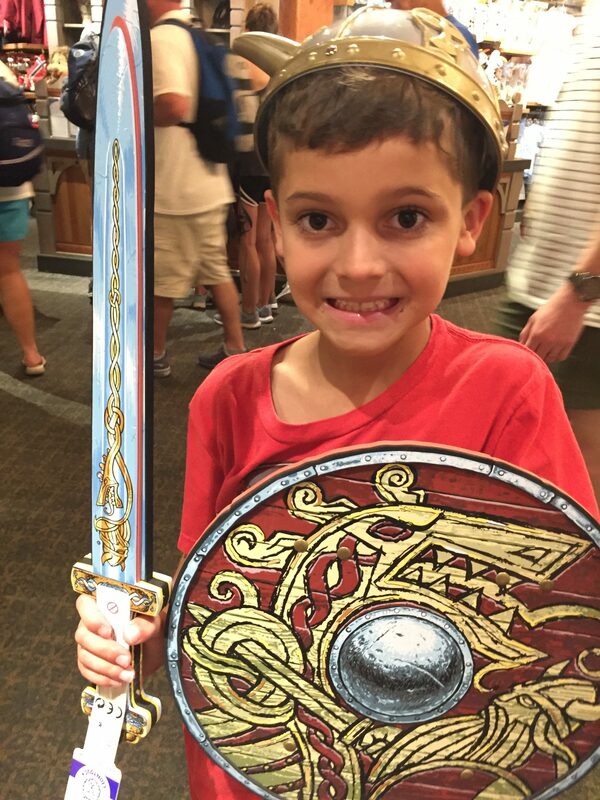 For the record, my kids did buy those swords and shields at Disney. The shield has held up well, the weapons, not so much. The axe actually broke already. It did seem like super thick foam. I think the sword and shield were the only really tempting things for my youngest. But we moved through the parks so fast we didn’t really give him time to stop and contemplate what to get. I did end up buying them the freeze dried ice cream at Epcot because I remembered buying it as a kid and loved it! (They weren’t really fans).